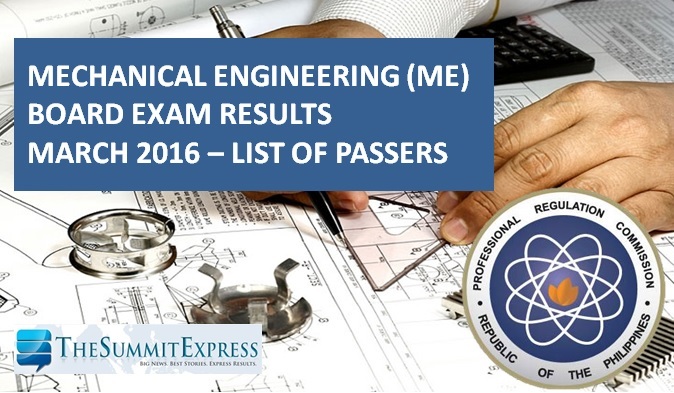 Those awaiting results of March 2016 Mechanical Engineer (ME) and Certified Plant Mechanics (CPM) board exam can find here the complete list of passers, topnotchers (top 10), top performing schools and performance of schools as the Professional Regulation Commission (PRC) and the Board of Mechanical Engineering released results in 3 working days after the exam. PRC on Tuesday, April 5, said that 910 out of 1,645 passed the Mechanical Engineer Licensure Examination and 33 out of 53 passed the Certified Plant Mechanic Licensure Examination. The first mechanical engineering licensure exams this year was conducted on March 30 and 31 in the cities of Manila, Baguio and Cebu. Examinations for ME board exam covered the following subjects: industrial and power plant engineering (Day 1); mathematics, engineering economics and basic engineering services, machine design, materials and shop practice (Day 2). CPM exams covered the folloing: elements of power plant machinery, shop machinery practice (Day 1) and elements of industrial plant machinery (Day 2). According to PRC, the target release date of Mechanical Engineer board exam results is on Tuesday, April 5, 2016 or in 3 working days after the exam. In September 2015 exam, results were announced online after 7 working days. 2,136 out of 3,866 passed the Mechanical Engineer Licensure Examination and 24 out of 51 passed the Certified Plant Mechanic Licensure Examination. In the same period last year, PRC released results after 3 working days. 739 out of 1,247 passed the exam for ME and 19 out of 28 hurdled CPM exams. Like Us on Facebook, Follow Us on Twitter to receive relevant real-time updates.